Burre Co. was founded in 2015 to produce high quality products that our customers could enjoy with confidence and peace of mind. Our health and wellness line, Burre Beauty, has the sole intention of making products that are consumer safe, affordable and most importantly, give the results you deserve. Our first product is an upgraded ultrasonic cool mist essential oil diffuser which will enhance your aromatherapy experience. Whether for your bedroom, home spa or office gift, this portable unit is the perfect item to be a part of anyone’s rejuvenation method. To best utilize this oil diffuser we recommend 100% pure and natural oils which can be found online. Our favorites are lavender, argan, peppermint, rosemary and sandalwood. Within the next year we plan to launch our own line of all-natural, organic, eco-friendly, and cruelty-free products that embody beauty and pure ingredients. These 100% Natural and Organic Essential Oils provide countless healthful benefits created by and sourced from indigenous medicinal plants to naturally treat and rejuvenate the human body. The best part is that these oils can be used topically or aromatically to provide a variety of sensory and wellness benefits. Portable, ultra-quiet aromatherapy solution for your home, office or spa. With Burre’s essential oil diffuser, say hello to stress relief, fresh skin and the incredible aromas of pure essential oils! Choose from two mist-modes: 30 second durations on-and-off, or continuous mist for up to 6 hours. The diffuser comes with LED lights that can be set to 7 different colors in dim and bright settings to fit the mood of your environment and create the best experience. With only a few drops of your favorite oils, fill up your home and enjoy a beautiful night of sleep. The waterless auto shut-off function gives peace of mind and saves energy. 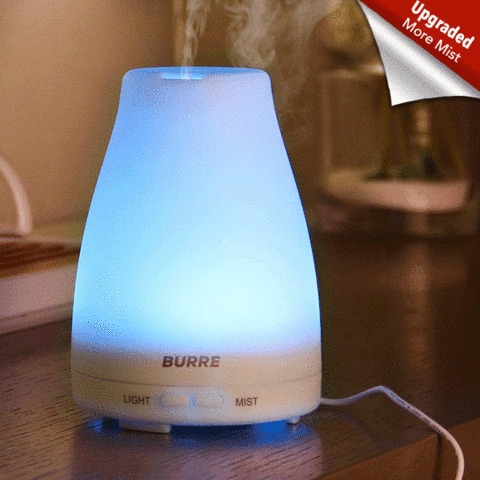 Burre Beauty Products Essential Oil Diffuser is awesome! Not only is this the perfect Essential Oil Diffuser for any room in the house but it's perfect for a night light. I placed this diffuser in my daughters room and she loved being able to select the color and have a beautiful night light to help her sleep. I love that I can add a few drops of essential oils. This diffuser distributes the essential oils into the air perfectly and also provides just the right amount of cool mist to help with allergies or dry air like we have here in Arizona. I also love that it automatically shuts off when it's out of water. Burre Beauty Products Essential Oil Diffuser is wonderful and I highly recommend it! Click HERE to learn more about Burre Beauty Products!